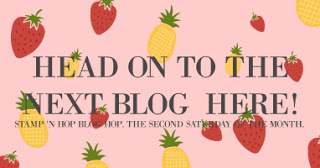 Today I am joining the May Stamp N Hop New Catalog Sneak Peek. My name is Tracy Marie and currently my husband and I are hanging out in the Pacific Northwest. I hope you enjoy this project and will continue along the hop for more inspiration from the up-coming catalog that goes live on June 1. Using the Love What You Do and Make A Difference stamp sets, I created this personalized anniversary card for my in-laws. These two stamp sets are in the new catalog, but for the month of May these sets are available in three special pre-release bundles. I've listed them below in the supplies list. The Make A different Alphabet stamp set is so pretty, but it does take patience to create long sentiments. 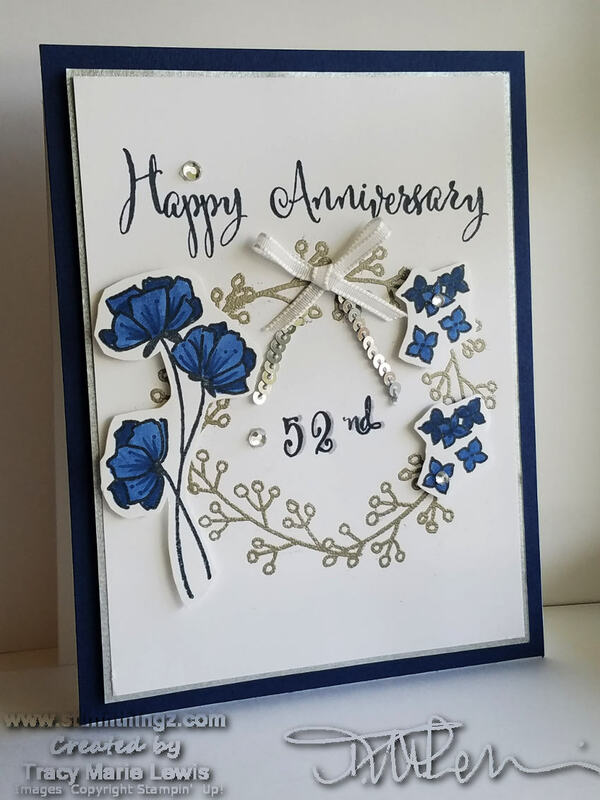 The included video tutorial explains my steps used to create the Happy Anniversary sentiment using the Make A Difference letters and the Stamparatus tool. The video also gives a quick review of the Stamparatus as compared to the MISTI which I have used since rekindling my cardmaking hobby many years ago. The wreath was applied using Versamark and silver heat embossing powder. It was created using repeated stamping of one of the foliage stamps from the Love What You Do stamp set. Various flowers from the same set were stamped in black, then colored using light and dark Night of Navy Blends. The bullet nib end was used to add the inner lines and dots on the flowers. The flowers were fussy cut and applied with dimensionals. The ribbon bow, mini silver sequins and clear rhinestones were added for the finishing touch. Video Length 28 min. 42 sec. The Night of Navy flowers almost look like Blueberry Bushel. Either way, I love the color! That is good to know since I haven't seen any signs of in-color Blends! What a great use of these stamps! Thanks for sharing! What a lovely anniversary card! Such a pretty anniversary card with this Suite, TFS.